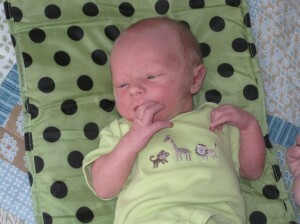 My darling hubby and I welcomed Logan Joshua to our family on June 6, 2011. He was 4 weeks early but did not require any time in the NICU. Thanks for being so supportive, everyone! Welcome to Logan! And Congratulations! Congratulations. Adorable. My little granddaughter arrived in February. It’s lovely to have a little one in our family again.